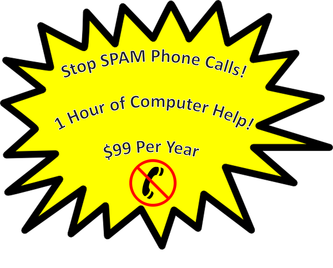 Worry No More - about SPAM phone calls!!! Includes Remote Support for your computer for checkups, Tune-ups, cleanups, diagnostics and more! When our SPAM Phone service is enabled, our system "screen" phone numbers that call you. If it’s a legitimate call, the call goes through to you. If the call is an illegal robocaller, our system intercepts the call and hangs up for you. See our FAQ for more information!